Indians were shocked on Friday evening to learn that Major Mukund Varadarajan and Sepoy Vikram Singh were killed in an encounter with terrorists in Kashmir. A statement issued by the military said, the army on Friday afternoon launched an attack in Karewa Manlo village after receiving information from the residents that there were militants in a house. Moments later after starting the operation, gunfire broke between the army and the militants leaving several people dead and scores of other injured. Sepoy Vikram Singh died during the encounter and major, who sustained serious injuries, succumbed while he was being rushed to the hospital. While Sepoy Vikram Singh body was sent to his village in Haryana, Major Mukund was laid to rest on Monday in Chennai. Thousands of people turned up to pay their last tribute to a man who was loved by many for his commitment to serve his country. State governor K Rossiah also expressed his grief over Mukund’s death. The Major, who hails from Tambaram, joined the 22 Rajput after receiving training at OTC, Officers’ Training Academy. He has left behind a wife and a 3 year old daughter. This is one of the many stories of soldiers who leave their families behind to be in war zones. They volunteer, everyone of them knowing that they may be caught in the middle of fire exchange. They don’t spend quality time with their families like we do. What they are busy with is doing whatever they can to ensure we never endure another Mumbai attack. The stories about soldiers and their families, as well as the burden they go through, are emotive. The stories of missed anniversaries, birthdays, family gatherings and celebrations, cannot begin to account for what our soldiers give for their country. The memories of Major Mukund and many other brave men and women who gave their lives for our country will live forever. As they willingly sacrifice their lives, they reflect the love that our forefathers praised. We owe our freedom to them. His wife left a touching tribute on her Facebook page. There lived a man who fathered my child…. There lived a man who believed in integrity…. There lived a man who loved his profession…. There lived a man who never feigned to be a hero…. There lived a man who was my soul…. There lived a man who revealed all to me…. There lived a man who loved me with his life…..
for he is with god.. I know this for sure..
You can hug me..hug me all you want…. Sign up and get Positive News to your Inbox. Annette Gabbedey – How This Lady Makes Jewellery Is Nothing Short Of Amazing. You Have To See It. “A major has died” – is all we heard on the news. Shouldn’t they atleast tell who it was and how he died? Don’t they deserve that much? Why such nameless faceless sacrifices by our men in uniform? We don’t need Arnab, Rajdeep and Bakha just shouting about politicians all the time. A country that fails to respect its Soldiers is setting itself up adversely in a future war. Let us show our gratitude and respect. Spread the message. कितने घर उजाड़ोगे हत्यारों,बस भी करो ….क्या कर रहा है तुम्हारा खुदा??? 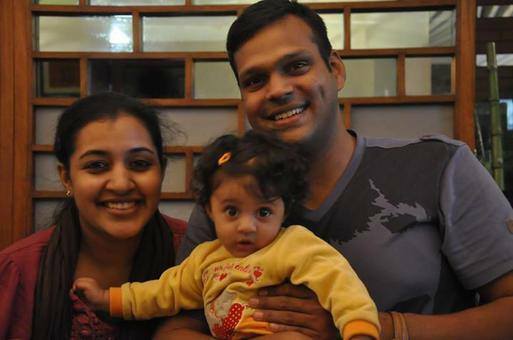 Her words made me cry, may god give her the courage to bring up the kid.Jai Hind Dear Major Mukund.